PCR plates and strip tubes designed to reduce evaporation and save you money! QPCR and PCR are common research focuses in many labs. Many of us have experienced inconsistencies between samples or even triplicates from run to run or well to well. Did you know that evaporation may be to blame? 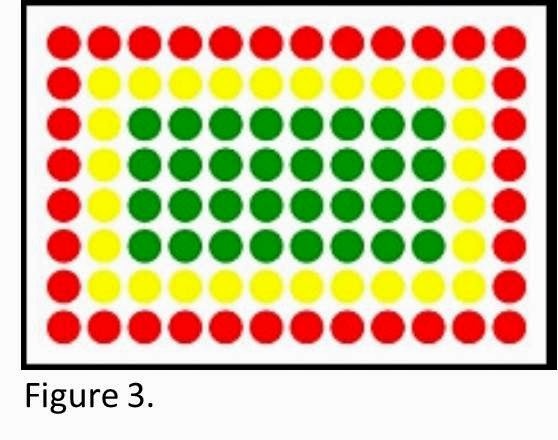 A small change in the volume of buffers can alter the pH of the mix in the well, impacting the ability of the enzyme to function efficiently. For instance, at 74C for every 5ul evaporation loss of a 25ul reaction, the pH changes by 1. What causes this evaporation and how can we minimize it to result in more consistent, repeatable experiments? Can we minimize evaporation so much that we can even downscale our reactions? A standard one-piece plate with a polypropylene frame expands by up to 2mm during thermal cycling (Figure 1). The issues arise when the sealing film or strip caps expand and contract at different rates, leaving a small space and opening up the well to evaporation. 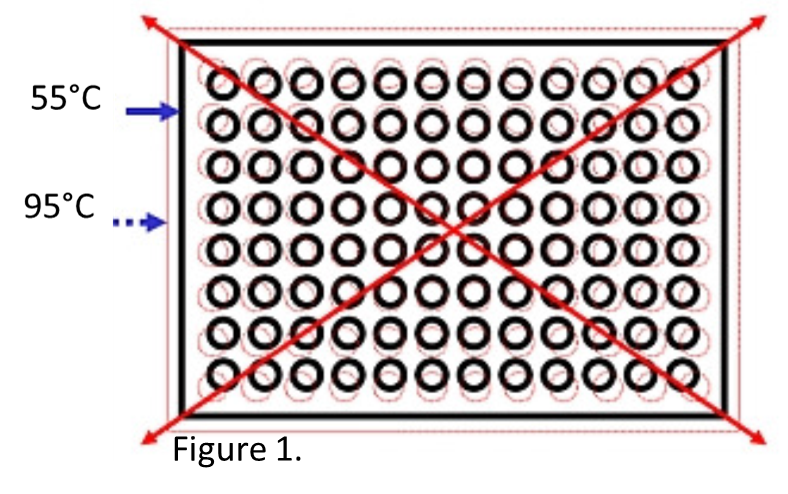 In addition, PCR blocks do not support PCR plates from the side, allowing for the high temperatures of the thermal block and heated lid to accelerate the expansion of the plates (Figure 2). Evaporation in itself is an issue, but a large issue also arises when uneven evaporation is considered. Generally evaporation occurs in the outside wells (Figure 3). More evaporation in one well over another means wells may have different pHs and thus differences in enzyme efficiency. This becomes an issue when comparing sample to sample or when trying to repeat experiments. Two-piece construction plates combat the issues of evaporation. In two-piece construction plates, the tubes are made of polypropylene and the frame is polycarbonate. Polycarbonate is a more rigid plastic that decreases the amount of thermal expansion, resulting in reduced evaporation and this improved PCR performance. Two-piece construction plates, due to the lower evaporation, allow for downscaling of PCR reactions. In comparing the volume loss of a one-piece plate to a two-piece construction plate, the researcher is losing money as each microliter of enzyme evaporates. For instance, as seen in Table 1, the outer wells of a one-piece construction plate lose almost 3 µl while the inner wells lose over 1.5 µl due to evaporation. 4titude®’s Framestar™ two-piece construction plates, on the other hand, only lost 0.57 µl per well in the outer wells and a little over 0.5ul in the inner wells. A loss of more than 6 times in the one-piece plates, adds up significantly in money loss. If you were to assume the master mix costs about an average of 10 cents per microliter, then in the One-piece plates, a researcher loses $23.32 per each 96 well plate due to evaporation (Table 1). In contrast, a researcher would only lose $5.33 in 4titude®’s Framestar™ two-piece construction plates. In PCR plates, small amounts of evaporation per well result in not only reproducibility issues, but also in money loss. Two-piece construction plates greatly reduce those issues. 4titude's lower evaporation per well, a researcher can save money by reducing the reaction reagent volumes without compromising results. Dr. Carolyn Denier in Berlin was able to reduce Sybr green usage by 40%, saving over $30 per plate and still maintain the consistent CTs she had in the past. 384 well users also see great results with 4titude® plates. Dr. Andreas Dahl in Berlin was able to downscale his reactions as well due to decreased evaporation. By reducing reaction volumes, a researcher can save significantly over time. Overall, 4titude®’s Framestar™ plates and strip tubes have less thermal expansion for improved sealing integrity resulting in lower sample evaporation. The lower sample evaporation allows customers to maintain more consistent results and downscale their reactions to save money. 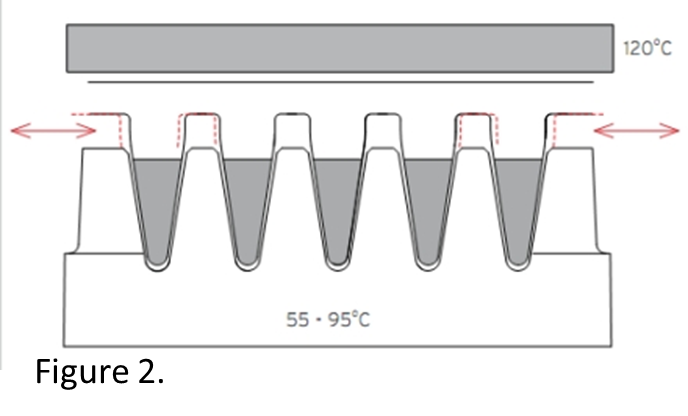 Due to the lower thermal expansion of the 4titude® PCR plastics from MIDSCI, these plates are great for robotic use in that they are more reliable for pipetting and stacking. The lower sample evaporation of 4titude’s PCR plastics makes these plates and strip tubes great for low volume PCR. The plates also come in white well format for higher sensitivity and even greater consistency from well to well. Call MIDSCI today to purchase the 4titude® cost saving products!